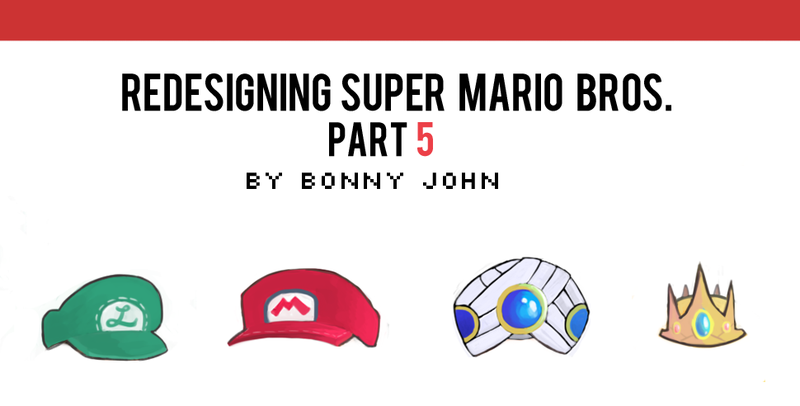 Filed to: redesigning super mario bros.Filed to: redesigning super mario bros.
Today we look at the key players of the story we're creating with all these characters. On one side, you have the force that is producing light to overtake all the darkness being spewed out by the other. It's Rosalina and Geno vs. King Wart and Phanto! Of this lot, Rosalina is the only one performing from the background, while Geno, Wart, and Phanto participate in the never-ending battle of good versus evil. The leader of the last set's minions has at last shown himself! It's the evil and powerful King Wart, climbing out from the deepest and darkest parts of Super Mario history. Yes, it's about time he comes back with a vengeance! My concept of Wart throws out much of the original and turns him into a proper toad, covered in warts. Wart is back and stronger than ever, using dreams as a tool as part of his manipulative ways. His advisor, Phanto, is connected to his mind using a necklace that establishes a link and is usually by his side unless out to cause havoc in the form of manipulating realities into nightmares. Wart once caused havoc with a dream machine - one that he has been long at work fixing in the background after his defeat years ago. Using the dream machine, Wart is able to distort reality and turn psychological torment into physical pain. Although his army is currently small, it is growing larger and larger through mind control, thanks to the machine. King Wart is seen here as regal as ever, with his robe draped over his back and large gold crown adorned on his head. I found an opportunity to turn his generic old necklace into something more interesting, and linking it with the character Phanto for some back story. As for his floating minion, Phanto's design is largely the same as before - it was only a matter of giving him the "HD" treatment upgrading his pixelated floaty head self onto the canvas. Where Phanto is new is in his role in the story. Opposed to the game's multiple Phantos flying about, there is only one in this game world. Phanto is powerless until linked with a living creature. There are 2 links it can share - one to the owner of the Phanto Medal (carried by a chain around the neck of Wart in this case), and then future links created as per Wart's request. How those links are made is by attaching itself onto the face of its victim. So long as the mask is worn on the victim's face, whatever the host is peering through of the eye holes of the Phanto mask is decided by Wart and his dream machine from afar. Phanto can only stay on the victim's face for so long before it loses its hold, so the ability is very temporary...But that one link could be enough to do the damage it seeks on behalf of its master. Sensing danger from her celestial abode, Rosalina scans the world below in search of a hero to best the villain known as Wart. With Mario and the gang busy fighting off Bowser's minions, she selects another character fight in her stead...Who could that be? In fact, this mystery character presents so much potential that it made Mario a second choice! Because Rosalina's consciousness was so pure and pristine, the cosmos themselves appointed Rosalina to be the caretaker of the galaxy, giving her immense power, but only in the plane above the worlds where she would soon call home. She soon began to spend her time creating little dolls known as "Luma" that she would give life to, and become their mother. Because the dream world falls into the jurisdiction of the celestial world she observes, she sees Wart as the biggest threat in the current battle below. Rosalina design is meant to be "pearalescent" in that she's just very silky, glowy, and mystical in appearance and nature. Even her outline is lighter than normal, as is her general depiction in terms of proportions and the like. The hues of her hair and clothes are very light to giver a feeling of transcendence and otherworldly. Her redesign was fun and simple, as her role is straight forward and the design calls for something flowy and free. My favorite aspect of this design is her hair and crown, and the departure in coloring style is indicitave of her role in the story. She is so far away visually from the rest of the cast as she is observing the battles from up above and away. Thus, she is very simple in presentation. At first I though I could make her design very elaborate but opted against it as something too frilly or complicated would be too ornate for a being on a higher plane - why would details like that matter to someone who is literally on a higher plane and less interested in materialistic things? Yes, the fan favorite Geno from Super Mario RPG comes back in full form! Geno is a character who surged in popularity when talks in forums for Smash Bros. put him at the top of many character wishlists. Although he's not owned by Nintendo, people hope for a miracle or two to get him back into the hands of big N. In this case, let's skip all that legal jargon and let Geno enter the fray! I had the idea of being at Rosalina's side right away. Rosalina is associated with stars and the cosmos, and Geno himself is a star being. I thought I might have been one of the first people to notice something like that, but who was I kidding? We've got the internet and although the relation hasn't been explored much, it has been noted by a few other people. That said, it gave me room to explore the two and give my own interpretation. Geno is a puppet who can take on various forms and shapes. He operates on star power, of various star energies, between stars as found in Princess Peach's castle, to the Lumas that fly about in space. The origin of Geno is that he was simply a doll to a younger Rosalina. Rosalina animated Geno to fight on behalf of worlds below who did not have any heroes like the Mario brothers. When she saw the power he carried, she thought it might be best to let him operate on star energy in spurts. Of course, she trusts his every judgement and action, but Geno is simply that powerful when "fed". As a star being, Geno is programmed to punish any and all who abuse the unfortunate and weak. He himself is very intolerable to social injustice and will go out of his way to step into any issue he feels needs to be rectified. Because Rosalina is a universal force, Geno is assigned to various worlds and planets to utilize his unbelievable strength to help balance good against evil. That said, Geno is constantly learning how to control his power. His abilities and level of strength vary depending in the world he finds himself in. Because his power can grow at an exponential rate and because there is no limit to how powerful he can get, Geno is constantly "reset" at the end of his missions as a failsafe. On the other hand, the memories and experiences gained remain. The moment he is reactivated, a rush of images run through his mind, depicting all of his prior "lives" before beginning the new mission at hand. Knowing this, Geno is actually afraid of himself and the damage he may cause while trying to do good. He has no fear of going into battle and worrying about his own health - he worries about the safety of those around him. Thus, the partner that Rosalina selects for Geno (in this story, it was Bowser Jr.) is someone who Geno will rely on to hone and control him if need be. Outside of all that, Geno is very wooden (pun intended) in nature. He cares about the matters at hand and really has no concept of leisure or fun - he was a puppet/doll/toy before gaining consciousness, after all. And although his original vessel and form were intended for enjoyment, he is more concerned about the powers that reside in him and how to use it on behalf of Rosalina, the only person in the entire world he truly cares for. Rosalina soon employs her selected hero to tend to Geno in his inactive doll state and to be carried around until activated. The hero quickly activates Geno, almost in record time and is thrilled to have Geno fighting on its side. I wanted to up the "jester" aspect to his design and I think it shows through. I had difficult deciding on what his clothes would look like underneath a cloak that I thought made him look mysterious and decorated. In his "active" state, the cosmos can be seen swirling about in his body, which he will generally cover with his cloak. Overall, call backs to the original design are very visible and I'm really happy with how he turned out. Thanks all for reading and checking out my artwork! Hope you're looking forward to some answers tomorrow, and as always, stop by in the comments below with some critiques and your thoughts on today's set!